Looks great, cute tops! "Just dropping the colors in to see what happens" is by far my favorite design technique, hehe! Lovely colors! And the blackberries are so cute. But I have to say that the blue colors remind me more of snow and ice. Thanks Kirppu, I think maybe I need to ask for a better camera for Christmas...someone else said it looks light blue, which is weird, because I see purple and green...lol! This soap looks wunderful!!! I like the colors very much and the "drop in" turned out really great. 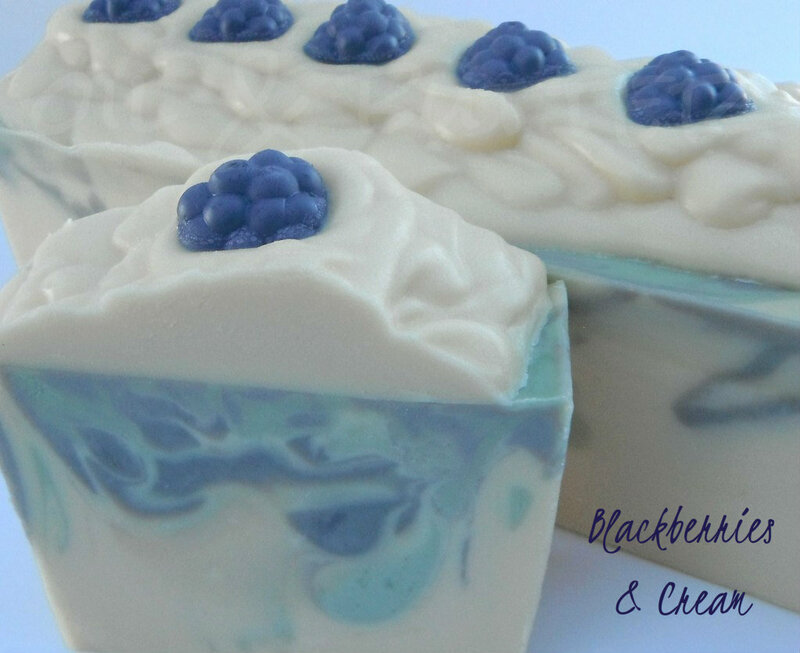 Another gorgeous soap, Cee Gee! I love your drop-in swirls, and the embeds are so cute. I wish I could get my tops to look as pretty as yours. Bravo! This one had been published while I'd been away,but now I found it again,and stopped by just to say that is really beautiful. I like all your soaps, I need to stop saying they are great,I'm repeating myself. I love colours,I'm really suffering from not having all those pigments. And what I like most about your blog is that you always give us the details on technique and procedure! I meant 'I love THE colours'! This soap looks just gorgeous!!! The blue colour looks fresh and creamy, like sweet blueberries. Thank you so much Vivien, I really appreciate it!